Cut cauliflower into slices and leaving them fairly large so they don’t overcook. Toss them in melted coconut oil, cumin, turmeric, salt and pepper in an 8” x 8” baking dish. Roast for 25-30 minutes, cauliflower should be tender. Meanwhile, rinse and drain the Quinoa. Bring 1 ½ cups of water to a boil in a small saucepan and then add Quinoa and stir. Bring back to a boil, cover and cook for about 15 minutes. Rinse and drain lentils. Put them in another saucepan, add enough water to cover the lentils, and bring to a boil. Then reduce heat and simmer uncovered until tender, about 20 minutes. Heat coconut oil in a large saucepan over medium heat. Add the cumin and pepper. Cook until fragrant, about 3 minutes. Add in the sliced onion and garlic, stir often, until slightly crispy, about 10-15 minutes. Turn heat to low. Add the cooked quinoa and lentils then stir to combine. Add lemon juice and half of the chopped cilantro and stir. 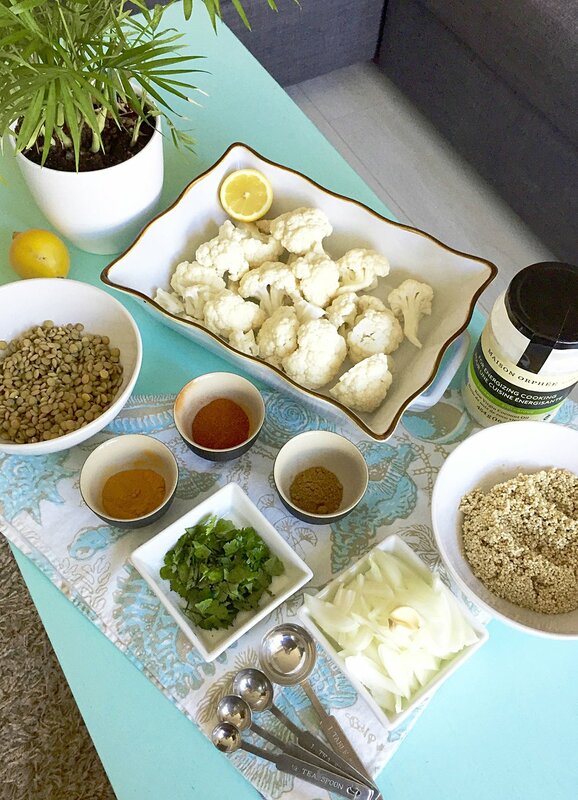 To serve, divide the lentil-quinoa mixture, as well as the cauliflower pieces, amongst 2 plates. Sprinkle with leftover cilantro, pinch of pepper and a squeeze of any leftover lemon juice. Serve warm.